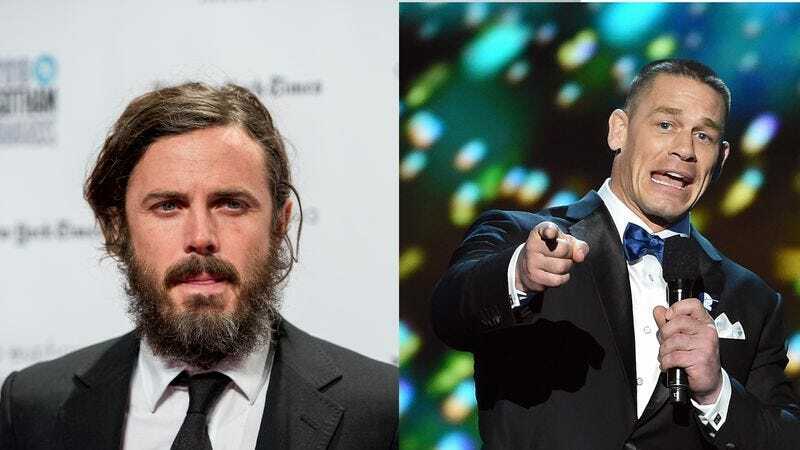 Saturday Night Live has announced that critically lauded Manchester By The Sea star Casey Affleck and large, man-destroying flesh mountain John Cena are both on the hosting docket for its December run of shows. Cena will tower over poor Kyle Mooney and the rest of the current cast on December 10, while Affleck will take the stage on December 17. Both men are making their hosting debuts. Affleck is currently getting praised all over the place for his performance as a loner forced to suddenly mature in Kenneth Lonergan’s Oscar-buzzing family drama. Cena, meanwhile—who we were legitimately impressed to learn holds the Make-A-Wish Foundation’s record for “most wishes granted”—is currently one of the biggest stars in the world of professional wrestling, and regularly appears on TV and film. Deadline reports that Maren Morris (“My Church”) will serve as musical guest on the 10th, while Chance The Rapper is being placed alongside Affleck on the 17th. Tomorrow night’s episode, meanwhile, will be hosted by three-time SNL vet Emma Stone, with Shawn Mendes as her musical guest.